For all his titanic batting feats, Sunil Gavaskar doesn’t quite earn the automatic applause of Kannadigas, partly because, well, he batted left-handed against Karnataka in a Ranji Trophy match that Bombay was about to lose. But largely because of his brother-in-law Gundappa Ranganath Viswanath. The stats of one cranks up the search engines; the style of the other inspires the poets, artists and aesthetes. To provide a modern context, it’s that very very special, self-effacing, self-less feeling that Vangiurapu Venkatasai Laxman brings to a table where other giants also sup and dine. “For many middle-aged men, including me, Sunil Gavaskar defines Indian batsmanship. But we all recognize that the modern era in Indian batting was inaugurated by Viswanath and sustained for a decade as much by his genius as Gavaskar’s. “Diehards like Ramachandra Guha will go to their graves insisting in the face of all the evidence that Viswanath was, in terms of pure genius and certainly in terms of the pleasure he gave to those who watched, the better batsman. “I once tried to persuade my father that Gavaskar was plainly the only Indian batsman of the Seventies who had a claim to greatness. Also read: Gavaskar: India’s most petulant cricketer ever? Are Gavaskar and Shastri India’s only cricketers? This entry was posted in Cricket, Etcetera, Issues and Ideas, Kannada & Karnataka, Mysore-Bangalore and tagged B.S. Kesavan, Churumuri, Mukul Kesavan, Rahul Dravid, Ramachandra Guha, Sans Serif, Srinivas Bhashyam, Sunil Gavaskar, The Telegraph, V.V.S. Laxman. Bookmark the permalink. ← Did Indira Gandhi have no role in the Emergency? This photograph is sensational. 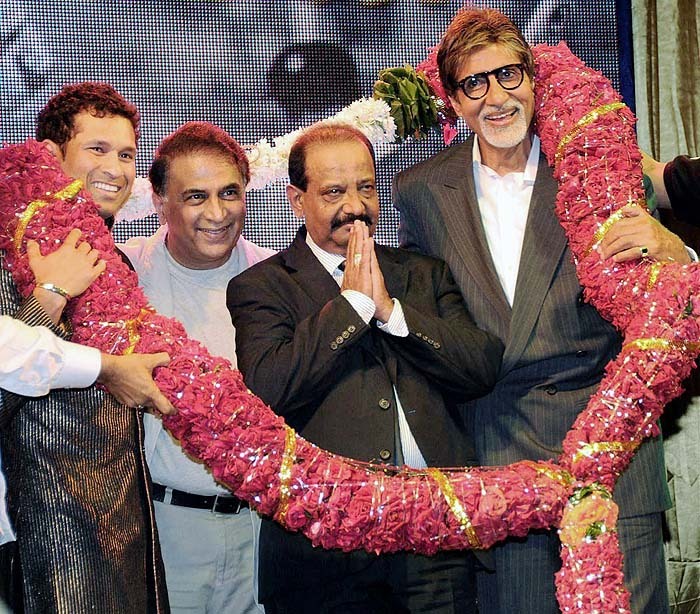 Would have liked Rajanna in place of Bachchan. It is not a question of beauty and functional batsmanship. Gavaskar’s contribution to Indian cricket as a player is much more than Vishy’s ever was. In fact, even Vishy has acknowledged this. SMG put spine into the Indian team, allowed them to shed their inferiority complex and laid the foundation for the Fab Four to build on it later.